The Toyark › Spartan C.I.O. Articles Related to Spartan C.I.O. HALO 4 SERIES 2 Action Figures From McFarlane Toys! The most popular character of the Halo universe, Master Chief, returns to action in Halo 4. Figure includes an Assault Rifle and features 28 points of articulation. Includes a code that unlocks exclusive Halo 4 video game content — Riptide Assault Rifle Weapon Skin. The Elites are back in Halo 4, including the popular Ranger variant first introduced in Halo: Reach. Elite Rangers feature a fully-sealed environment suit and an airtight helmet with clear visor; perfect for extra-vehicular activity in the vacuum of space. Our Elite Ranger figure comes with the redesigned, Halo 4 version of the Beam Rifle. Includes a code that unlocks exclusive Halo 4 video game content — Chill Storm Rifle Weapon Skin. The Kig-Yar, commonly known as Jackals, return in Halo 4 as part of the alien Covenant that continues to threaten humanity and the UNSC. The Storm Jackal features the new, more sinister look seen in Halo 4. 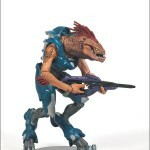 Figure includes the redesigned version of the Covenant Carbine weapon. Includes a code that unlocks exclusive Halo 4 video game content — Engage Carbine Weapon Skin. An all-new Spartan armor type making its debut in Halo 4, the Spartan C.I.O. is distinguishable by its unique helmet with three optical sensors. This brand-new Spartan figure is clad in violet armor and comes with the latest version of the Designated Marksman Rifle, a popular mid-range UNSC weapon first introduced in Halo: Reach. Includes a code that unlocks exclusive Halo 4 video game content — Ruin C.I.O Armor Skin. The fan-favorite Scout armor, previously seen in both Halo 3 and Halo: Reach, returns in an updated, yet instantly recognizable form for the Spartan-IVs of the UNSC Infinity in Halo 4. Our Spartan Scout figure features a rust paint scheme, and comes equipped with the new Sticky Detonator weapon; previously only available with the Master Chief in the UNSC Cryotube boxed set. Includes a code that unlocks exclusive Halo 4 video game content — Toxic Scout Armor Skin. An all-new Spartan armor type making its debut in Halo 4, the Spartan C.I.O. is distinguishable by its unique helmet with three optical sensors. This Walgreens Spartan exclusive figure is clad in steel and green armor and comes with the latest version of the Designated Marksman Rifle, a popular mid-range UNSC weapon first introduced in Halo: Reach. Includes a code that unlocks exclusive Halo 4 video game content — Bones DMR Weapon Skin. In scale with our standard 6-inch figures, these deluxe boxed collectibles bring the larger characters and accessories of the Halo universe to your toy collection. Our Didact action figure captures every detail of the Master Chief’s powerful nemesis, from the wicked spikes of his metallic armor to the glowing lines tracing along every piece. Figure stands approximately nine inches tall, includes 29 points of articulation, and includes a code that unlocks exclusive Halo 4 video game content — Refractive Venator Armor Skin and Refractive Suppressor Weapon Skin! › Companies: McFarlane › Characters: Master Chief, Spartan C.I.O. 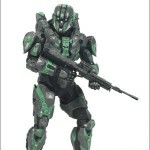 McFarlane Toys revealed shots of an upcoming Walgreens exclusive Halo 4 Spartan C.I.O. The figure dons a green and grey color scheme, and comes with the Designated Marksman Rifle. Check out pics and details after the break!